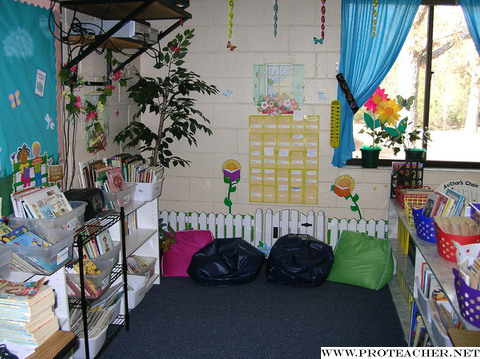 Located in the back corner of our classroom, our "Reading Garden" helps brighten things up and makes our classroom a little more cheerful with bright flowers, butterflies, and even a tree. The garden is a nice place to snuggle on the pillows with one of the many books found in bins there. Each book has a pocket inside with a card in it and the students are allowed to check out books on their own by placing the card in their checkout pocket on the wall. The books are arranged in tubs generally by topics such as books for partner reading, books about school, and nonfiction books about animals. The books also have a colored sticker on the front cover which corresponds with the sticker on the tub to help with placing the book back into the correct bin.